It’s hard to believe that this May it’s already going to be two years since we first opened our door to all of you who then found your way back to us again and again. On this truly special occasion we invite all the old and new faces to join us at the 2nd Anniversary Weekender. Expect nothing less than the finest: Steffen Bennemann, DVS1, Interstellar Funk, Claudio PRC, Solar, outdoor area, great food & drinks, our residents & friends. Note that more details regarding the schedule of the weekend will be announced in the coming weeks. The two-day programme begins on Friday night when DVS1 is locked in for the long-awaited Ankali debut. Zak Khutoretsky is one the most respected names of the Techno scene. Hailing from Minneapolis, DVS1 runs the labels HUSH and Mistress and aside from spreading hard-hitting gospel worldwide all year long, he’s released cuts on Ben Klock’s Klockworks as well as produced remixes for the likes of Trus’me, Terrence Dixon and Nina Kraviz. Opening the floor for him will be our residents and two of the busiest DJs in town – fleika and nrmn. Also on the bill is Steffen Bennemann, one of the brains responsible for Nachtdigital, a festival held annually near Leipzig (where this year at the festival’s final edition we happen to be hosting a stage). Steffen is a familiar name to anyone who’s spend some time in clubs in Prague, most recently you could catch him play an extended b2b with Bufiman at the Nachti party in Ankali. Expect finest House seasoned with reckless Acid, Electro and other trance-inducing danceables. The Italian hypno-techno mastermind Claudio PRC will be joining us for the weekender too, cementing the fruitful collaboration we started off last year. Since becoming our resident, Claudio has been hosting the Volumi Dinamici party where he hosted such great selectors as Wrong Assessment or Cio D’or. This time he will get to show his more minimalistic approach to club sounds in a daytime b2b set with the Berlin-based selector Hubble. Interstellar Funk is an Amsterdam-based DJ whose reputation was outlined by residencies in two of the most important club institutions in the Netherlands: [now-defunct] Trouw and De School. Due to his love for analogue machine music as heard on his releases on Dekmantel, Berceuse Heroique, the word later spread worldwide. Expect Funk-fueled club trax with warm analogue accent. Joining him on the Saturday night lineup will be Solar, a veteran DJ from San Francisco who cut his teeth organizing raves and smaller scale events in the Bay Area (in and around of SF). As a resident DJ of many of these events, he’s adopted wide sonic language to communicate with the dancers – blending Techno with Psychedelic Rock, House, Disco and beyond. Following decades of low-profile fame on a local level, Solar’s recent mixes for RA and Dekmantel [who also invited him to play their festival in Amsterdam] sparked interest for him worldwide and we’re excited to see him do the magic in Ankali for the very first time. 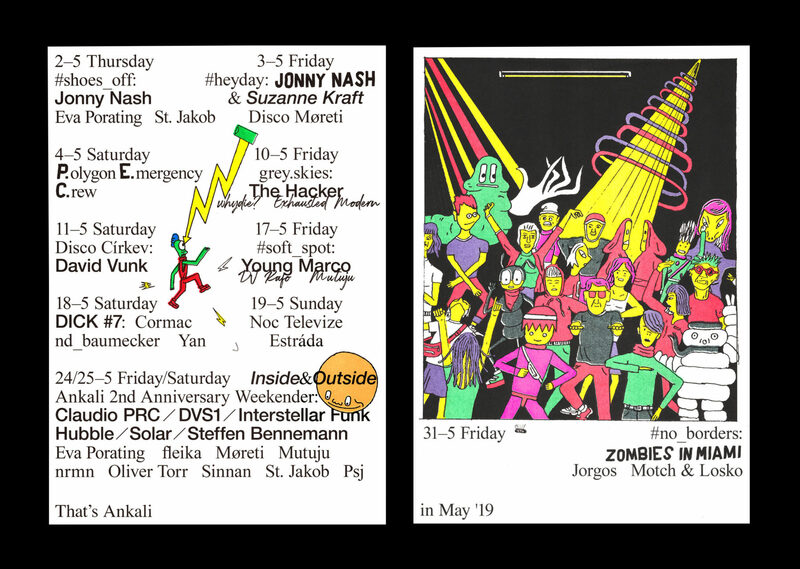 The programme of the weekend is complete with an extended family of our residents and friends – if you’ve ever crossed the threshold of Ankali, you’ve seen one of them do their thing behind the decks: PSJ, Moreti, Oliver Torr, St. Jakob, Eva Porating, Sinnan and Mutuju. As mentioned above, the daytime programme on Saturday will be happening in a nearby outdoor area equipped with yummy food & drinks and – naturally – a soundsystem. Stay tuned for the detailed schedule.